Cumulus Media appoints veteran Bay Area veteran radio programmer Lee Hammer as Program Director of Talk outlets KGO and KSFO in San Francisco. Hammer served as KGO and KSFO's interim PD in 2015, when he was also the PD at KNBR 680 and KNBR 1050 (KTCT), positions he held for 12 years and over 19 years, respectively. Hammer was elevated last year to Operations Manager for the Cumulus cluster in San Francisco and VP/Play-by-Play Programming for KNBR. He assumes the additional role of KGO and KSFO Program Director from recently appointed Program Director Jack Swanson, who will now serve as a programming consultant for the two Talk outlets. Cumulus Media/San Francisco VP/Market Manager Doug Harvill said, "Lee Hammer did an excellent job while handling the programming for KGO and KSFO. It's an easy choice to hand Lee the keys to these two legendary radio stations." He added, "Jack Swanson has decided he's happiest spending his days playing on the beach rather than sitting behind a desk. 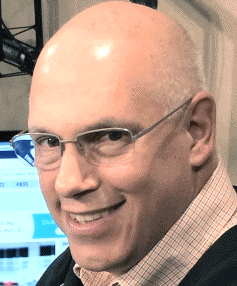 We're pleased he'll continue to share his vision about the future of KGO and KSFO as he continues to serve the stations as a programming consultant." Hammer said: "I'm thrilled to have the opportunity to work with the talented professionals at KGO and KSFO. I want to thank Doug Harvill for his confidence in me, and for the opportunity to consult with Jack Swanson, who is without a doubt, one of the top talk radio programmers in the country." Swanson commented, "I realize my decision to return to the beach is sudden. I quickly fell in love all over again with these wonderful stations and their talented people, but ultimately, my change of heart comes from my desire to fully enjoy a future of unlimited fun, travel and adventure. And making this move complete, through the unbelievable graciousness of Doug Harvill, Lee Hammer and the entire Cumulus Corporate team, I'll still have the opportunity to contribute my ideas for the future of these amazing radio stations."